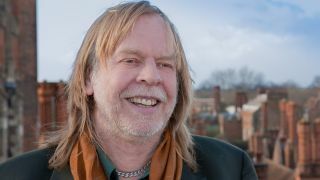 Rick Wakeman has described Yes offshoot Anderson Rabin Wakeman as a five-piece band rather than a trio with sidemen, after completing their first rehearsal sessions in the US. The band last month confirmed that bassist Lee Pomeroy and drummer Louis Molino III would be part of the lineup for their world tour. They spent last week rehearsing a mix of classic Yes tracks and new material – and the keyboardist has professed himself “so enthused” with the results. Wakeman says in a blog post: “Trevor, Jon and myself have been spending the last few months preparing ideas for the concerts. I arrived in Los Angeles on August 7, and for the next seven days ARW rehearsed solidly, with ideas constantly changing, and for the better. Describing Anderson as “singing so well” and Rabin as “one astonishing player,” he continues: “Whey we haven’t done this before is beyond me! Anderson Rabin Wakeman commence their run of US dates on October 4, with additional appearances to be added in December. They tour the UK and Europe in March next year. Frontman Anderson said in July that, while the band would release new music, they weren’t planning to make a full album. Meanwhile, Wakeman has four additional releases planned for this year.